Safety is central to the responsible delivery of energy. We continue to strengthen the safety culture and leadership among our employees and contract staff, with the focus on caring for people. Our safety goal is to achieve no harm and no leaks across all our operations. We refer to this as our Goal Zero ambition. We develop and operate our facilities with the aim of preventing any incidents that may harm our employees, contract staff or nearby communities, or cause damage to our assets or adversely impact the environment. We carefully consider the potential environmental impact of our activities and how local communities might be affected during the lifetime of our projects and operations. We seek to comply with environmental regulations, to continually improve our performance and to prepare to respond to future challenges and opportunities. We manage safety risks across our businesses through clear standards, controls and compliance systems combined with a safety-focused culture. We focus on the three areas of safety with the highest risks associated with our activities: personal, process and transport. We ensure that people responsible for tasks involving a significant safety hazard have the necessary training and skills. Process safety management is about keeping hazardous substances inside pipes, tanks and vessels so they do not cause any harm to people or the environment. It starts at the design and construction stage of our projects and is implemented throughout the life cycle of these facilities to ensure they are operated safely, well-maintained and regularly inspected. In line with industry standards, we measure and report according to the significance of the incidents, with Tier 1 as the most significant. In 2018, our process safety performance improved. The number of Tier 1 and 2 operational process safety events decreased from 166 to 121. In 2018, the most significant process safety related incidents were a fatality at our Rheinland refinery in Germany and a spill at the Trans-Ramos pipeline in Nigeria. 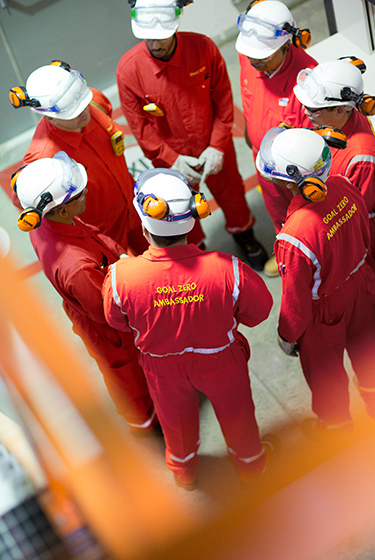 We require all incidents to be investigated to understand the underlying causes and seek to translate these into improvements in standards or ways of working that can be applied broadly across similar facilities in Shell. More information on our 2018 safety and environmental performance can be found in Shell’s Sustainability Report.